In this parody of Teenage Mutant Ninja Turtles, four hamsters are sent to space to deal with a blob of radioactive cosmic jello. They destroy the blob, but are exposed to its radiation before crashing back to Earth. 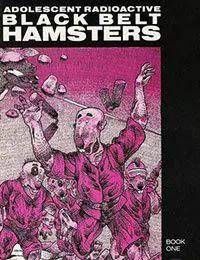 The hamsters, Bruce, Chuck, Jackie, and Clint, become anthropomorphic and learn martial arts under Master Lock and others in the Himalayas.They are finally sent out into the world, and run into a drug dealer on the way to the Himalayan airport. They beat him up and steal his car, which turns out to have $312,077.12 in the glove box, which they take as well. They take a plane to the west, but the P.L.O. (Pot Luck Organization) tries to hijack it, and the hamsters stop them using their trademark anarchic violence and humor.The issue also involves self-referential appearances and comments by the author and artist.